SUMMARY: In this post-apocalyptic future, plague is killing masses of slum-dwellers. The United States no longer exists, and The Republic is constantly at war with The Colonies. Fifteen-year old June, born into a wealthy family, is a military prodigy, the only person ever to score a perfect 1500 on her Trials. When her beloved brother is murdered, June will stop at nothing to track the elusive street criminal Day and bring him to justice. But meeting Day, who is June's age, causes June to question everything she knows about The Republic government she works for. REVIEW: LOVED! I loved everything about this book. It's a page-turner right from the first chapter. 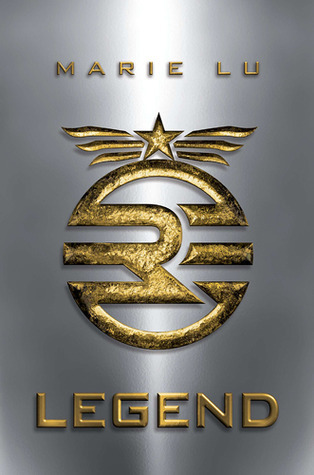 Character and plot are driving forces in Legend. June and Day are believable, likeable characters. Their lives could not be more different, yet they complement each other well. Though they grew up on different sides of the law, both are smart, resourceful, and will sacrifice anything for the people they love. Their romance is sweet and simple, even as their lives are anything but. Other characters are equally dynamic. I want to know more about Thomas, a friend of June's brother's who secretly loves June. I'm certain we haven't heard the last of Kaede, a teen bartender and street-fighter who hides plenty of secrets of her own. And let's not forget about the Elector's son...he could be an interesting twist in the sequel. With mystery, action, and romance, the plot has plenty going on to keep readers interested. The political intrigue never gets boring, and it is interesting to see how easily The Republic manipulates and controls its masses. I love the creepy Elector and would love to know more of his story. He reminds me of President Snow in The Hunger Games. I love how there are several plot threads revolving around the central mystery of who really killed June's brother. The final chapters bring the story to a pause, wrapping up some problems while leaving plenty unresolved for the sequel. THE BOTTOM LINE: There are so many great YA dystopian novels in print right now, but Legend stands out among the best of them. A must-read for YA dystopia fans! STATUS IN MY LIBRARY: We have it. I will have no problems "selling" Legend to my students. It's relatively short, easy to get into, and engrossing. Plenty of action and romance make it one of my recent favorites. But maybe I will read Enclave by Ann Aguirre first... What do you think of it?